From a scientist, April 22, 2017: "Because a scientist disagrees with a group of politicians does not make that scientist position 'political'." It doesn't necessarily make it scientific, either. Note: much of the material below comes from two societies, Sigma Xi and AAAS, simply because documentation was handily available when I was writing this paper. I don't think they are atypical scientific societies. With huge monetary encouragement from sources like George Soros, many Americans are on the march, demonstrating their displeasure with President Trump. In a fairly new wrinkle, scientists are joining these marches, not as individuals but as scientists. I'm not sure what exactly the scientists are marching for. Or against. Budget cuts are frequently mentioned. But budget cuts and budget wrangles have always been part of the political process. Hyperbolic accusations that the administration is destroying science and is anti-science are new. If that weren't enough, for several decades, many prestigious scientific societies and a large number of their members have, to some degree, accepted that the planet is warming at an increasing rate, and this is becoming severe enough to threaten humanity's future. This isn't just talk at leisure moments in the workplace. This reinforces global political plans. Aside from blaming recent hurricanes and floods on Climate Change, the Secretary-General of UN recently asserted, "The answer lies in the total transformation of our economies, and this is achievable." [emphasis added] (Leaders' Dialogue on Climate Change, 19Sep2017). The UN has reassured us that "[a]ffordable, scalable solutions are now available to enable countries to leapfrog to cleaner, more resilient economies." That might be too rosy a picture, but certainly giving money to the UN would hugely increase the UN's political power in that it would control the distribution of massive funds around the world. Many scientists and non-scientists have questioned whether these solutions are anywhere near adequate or realistic but few have suggested that Trump's non-conformist attitude might be a sensible response to the U.N.'s plans for handling climate. Instead, the emphasis has been on condemning Trump. He is also accused of blighting the environment because he's stripping the EPA of power it doesn't legally have. To hear some tell it, one would think he is literally muddying the waters. On the whole, the knee-jerk response of many is to accuse him of evil intent towards SCIENCE. In practice, this seems to mean scientists marching and participating in rallies with groups whose belief-structure is of the Far Left. Science is becoming another whip with which to flay Donald Trump. "Scientists with the street smarts of a immune-deficient child brought up in a bubble have announced they are entering politics. They are to a man/woman politically liberal. Many were educated by scientists brought up in an era when liberals were really liberal, and they haven't noticed that the far left has been taken over by anti-semitic, pro-antifa, race-divisive, islamophilic regressives who call themselves progressives. Unlike the old-time liberals who believed in live-and-let-live, fair play, and enthusiastically exploring the unknown, this generation of liberal leaders prefers to colonize new territory with old ideas. One-world governments and a rosy version of Marxism are back in intellectual fashion. Once upon a time, an aura of integrity emanated from a scientist's account of his work. It stemmed from his willingness to say, 'Yup, I think that jackass might be right — his explanation covers more ground and relies on less suppositions. But I think his conclusions are shaky when it comes to X and I will be looking at X next.' On peer-review panels, working scientists were willing to vote funding for a competitor, based on his on-going work and what he planned for the future, even though shrinking budgets meant their own work might suffer. Contrast that with the statements by prominent researchers in Anthropogenic Global Warming (AGW) that peer-reviewed journals on climate should not accept papers by heretics that question the religion of a human-caused global holocaust. From what I read, the usual no-holds-barred 'negotiating' on the science budgets in medicine, physics, engineering and agriculture is going on between the administration, congress and the scientific societies. Cuts have been announced in dramatic headlines, but funding for some of these projects seem to be quietly tucked away in other initiatives. Yet the urge to protect some vague but noble entity called SCIENCE has welded many scientists together in nouveau activism. When I was dealing with scientists decades ago, it was respect for sturdily-reinforced results that welded them together. Scientists had respect for the complexity of even the limited field where they had expertise. They were cautious about accepting anyone's results — including their own — in meagerly explored areas. I suspect that it is still true. I would guess — but no longer have first-hand knowledge —that most working scientists leave causes with global consequences to futurists or more often to science fiction writers. At least I hope so. But there is a cadre who claim to speak for scientists about Science. Their current major interest is in what affects global climate. They like to call it AGW, which puts the blame directly on human activity. They call it climate change when they are cautious because of negative feedback. In a sense, this is a misnomer. They don't think of climate changing in mode or direction; it only gets hotter as time goes by. Their adopting climate change as an alternative name for AGW has annoyed many who have always insisted that climate continuously changes over the eons; climate is cyclic and slowly over time it changes from very very cold to very very hot and then back again. In simple words and ignoring the large gaps proponents need to jump across to connect these statements, these are roughly the major points in the AGW argument — in scientist lingo, this is a first approximation. We have data and models, some solid, some inferential, some extrapolated, some analogous, some proxy, that show that within recorded history, there has been global warming. This is due to people breathing out, animals farting and us using fossel fuels. We are responsible for the increase in greenhouse-gas emissions, which cause the warming. This warming is rapidly increasing and likely will soon be irreversible. The ultimate solution is to give an august body like the United Nations gobs of money and put it in charge of our economy, our political system and our lives. For decades, the believers in AGW have castigated those they call 'deniers' or even more darkly, "climate change conspiracy theorists". The attitude of many scientists and the heads of some scientific organizations seems to be: If you don't believe in AGW, it's not because you question the data. It's because you are a heretic, and you're just lucky we're not living in the Middle Ages. But shun you we will. Wessel wrote that "the American Chemical Society (ACS) in Washington, D.C., announced its support for [a] march, 'predicated on two essential conditions.' 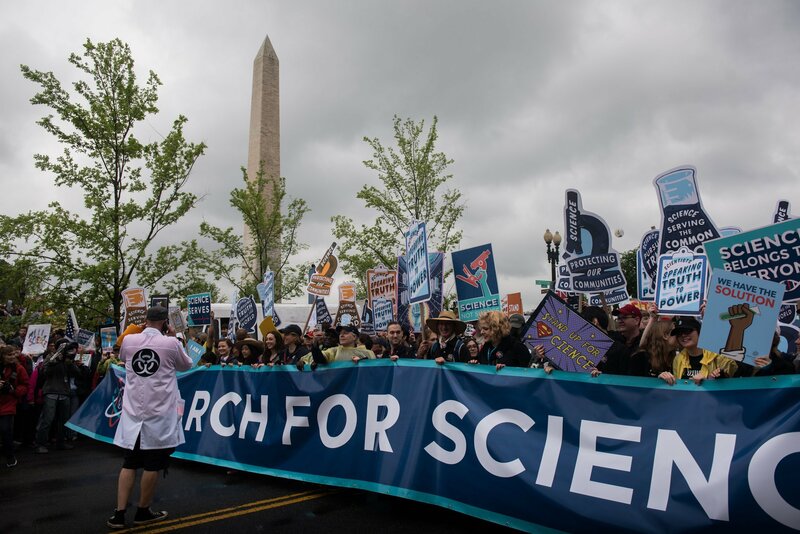 One stipulation by the 157,000-member society is that the march must 'adhere strictly to its established and publicly posted mission and principles' The other is that the event must 'be a nonpartisan celebration of science.' The ACS conditions reflect concerns expressed by some experts that such a large, grassroots movement will struggle to stay on message." That's putting it mildly. It was unrealistic to expect that input by the relatively small number of actual scientists not be swamped by leftists and other special interest groups that showed up. "Calling science critical to economic growth and environmental protection, he [Trump] said, 'My administration is committed to advancing scientific research that leads to a better understanding of our environment and of environmental risks. ... As we do so, we should remember that rigorous science depends not on ideology, but on a spirit of honest inquiry and robust debate.'" It made signs that read "Stop denying the earth is dying," "Resist Trump. No cuts to Science! Socialist Alternative," "Keep your tiny hands off my science," "Science belongs to everyone" and "Science it's like magic but real" seem unbalanced and rather, well, silly. How did 'real scientists' react? IF write-ins from the membership of the Sigma Xi Honor Society are typical, there were a couple of negative comments about the April march, such as this one: 'The "March for Science' is an absurd idea. Sigma Xi and its members should focus on doing and reporting on legitimate credible science, and stay out of politics," (February 27, 2017, The Lab: Members to Members Digest). But for the most part, those members of Sigma Xi that wrote in were enthusiastic and many planned to participate. After the marches, participants wrote that the marches went smoothly and were attended by thousands and the locals were friendly. Judging impact was harder, perhaps because the reasons people came to the marches varied and in some marches, science concerns were drowned by 'Power to the People' messages. While I've found high media acclaim for the marches, there doesn't seem to be much information on how many scientists actually attended. John Nemeth of Sigma Xi (May 15, 2017) wrote that there were a million marchers world wide. But that doesn't tell us how many actual scientists marched. Random interviews of the participants were heavy on people "studying science" or "working in science." THE MARCHES FOR SCIENCE WERE CONSPICUOUS INDICATORS of more open activism by the scientist. But we shouldn't ignore the role played by the leadership. In some societies, the call for activism comes directly from the CEOs. They coordinate efforts and organize events. They reassure the scientist that lively protest is acceptable. Comparing new announcements with how scientific society heads spoke decades ago, the administrators of some of our scientific societies are surprisingly assertive. Certainly, the CEOs and directors have gone well beyond relying on support such as the solidly-grounded Consensus-Development Conferences at NIH, where limited conclusions were formed from well-tested data. Many of this generation have the truth. They speak boldly for what they are sure and certain is scientific truth. The stiffen the spines of administrators of other societies who are more hesitant. Of the several scientific societies to which I belong, I don't recall being asked whether I agree with a policy before it was firmly annunciated by the society's administrators. Like a drug addict or alcoholic who wishes to get better, the first step is admitting the problem. When our idiot politicians, mainly in the Republican Party, finally admit the real cause [man], then we can work towards a solution. Until then, we are dealing with alcoholics who refuse to admit their illness. Anyone not in agreement is "playing partisan politics." Some writers accused "deniers" of rejecting AGW for venal reasons. As one put it (April 28, 2017) "they feel science will hurt their vested economic interests." It doesn't occur to them, that, given that much of the work of the societies is, rightly so, gaining a bigger chunk of the budget, they themselves are hardly above the fray. Nor is the competition evil for having similar motives. With an attitude that sees the opposition as willfully unreasonable, even evil, it is easy to begin to see oneself as the victim, targeted by scheming politicians and deniers. The process has been perfected, as we've seen — in an imperfect analogy — by Muslim community leaders who see every terror act as an excuse for the larger community to pounce upon their innocent Muslim community. They see themselves as the ones that suffer because of an act of terror by one of their members. The actual victims are only the occasion for making their lives difficult. Similarly, true believers in the science communities often see budget cuts as the war of politicians on science, as if they are a unique entity and not subject to the processes that govern the divison of the overall budget. An old-timer member made some telling remarks: "In my experience the scientists were no more qualified in politics than the politicians were in science. [...] When I joined Sigma Xi in 1959 it was a scientific organization now it is political. Does Sigma Xi represent me?" Let me give give you two examples of the new certitude. Choosing not to address climate change would put current and future generations at great risk. At AAAS, we do not have a partisan political agenda. But we do have an urgent mandate to rise up when others seemingly ignore evidence or attempt to manipulate science for political purposes. Whether it is dismissing science advisors at the EPA, ending cooperation to deal with climate change, or trying to curtail biomedical research—all of us are affected. It's up to us, as science advocates, to do everything we can to support research and innovation, to see that scientific understanding is sought and provided, and to fight crippling attacks to the science enterprise. AAAS is leading the way, but we need your help to continue to protect the advancement of science and give policymakers the tools they need to make evidence-based decisions. I urge you to support AAAS today with a gift to our Flexible Action Fund, because together we are a stronger force for science. Give today. Be the force for science. Educate decision-makers about the importance of science funding. Develop credible and current science resources for teachers and students. Rally the science and engineering community to promote the value of evidence-based decisions. We can't lose momentum, and we urgently need your support to continue this important work. Together we will run to the action — and bring the evidence with us. This next is rich. It was written by John Nemeth, CEO of Sigma Xi, the Scientific Research Honor Society. You may remember the scandal known as Climategate late in 2009 when leaked emails from the University of East Anglia (UEA) indicated that the UEA climate scientists and their colleagues were unwilling to let their raw data be examined by outsider scientists. Michael Mann of Pennsylvania State University was indignant that a skeptic would question his data. His buddies wrote about preventing anyone that disagreed with them from publishing in 'their' journals. What's even more serious, their unchallenged results became part of United Nation's IPCC reports. "The IPCC has produced five 'assessment reports' since 1988, which are often cited as reflecting scientific consensus for the existence of global warming caused by human activities producing greenhouse gases, particularly carbon dioxide." (Leuck, 27March2017, here.) Mann is also known for his dramatic 1998-99 'hockey stick' representation of global warming which indicated a very steep and recent increase in global warming. The graph used temperature data taken directly from instruments together with selected proxy data of tree-ring sizes over the last millennia and exaggerated the degree of warming. Mann was exonerated of any wrong-doing. Some of you will complain that this post is political. It is not. This is information all of us must have and then consider. We are trying to be vigilant in these times more than ever, and I offer that we must participate by identifying ourselves and our colleagues as a large part of the world-wide community of researchers who are custodians, dare I say defenders, of facts and evidence known thus far in the process of discovery of how the physical universe works. I am struggling to remain dispassionate, to make you proud, to represent you. So, I will simply write that research is clearly and publicly under attack. The following description of parts of Wednesday's House Science Committee hearing is copied below from THE HILL. Links to other accounts follow. This week Members of the House Science Committee battled over the validity of climate science during a Wednesday hearing. Committee Chairman Lamar Smith (R-Texas) opened the hearing by saying he believes "the climate is changing and that humans play a role." But, he added, "I also believe significant questions remain as to the extent." "Much of climate science today appears to be based more on exaggerations, personal agendas and questionable predictions than on the scientific method," he said. "Those who engage in such actions do a disservice to the American people and to their own profession."..... Democrats' chief witness, climate scientist Michael Mann, criticized committee Republicans for their NOAA probe, saying it "is meant to send a chilling signal to the entire research community, that if you, too, publish and speak out about the threat of human-caused climate change, we're going to come after you." "That is not known as an objective writer or magazine," Smith said. Mann replied, "Well, it is 'Science' magazine." If AAAS and Science are not objective, what organizations representing our research professions are trustworthy? What does this say about the hundreds of thousands of researchers we all count as our members, our colleagues? I suggest that the attitude of Mr. Smith and his associates about AAAS applies to us and everyone else in the research enterprise. This matter is I believe an important topic for Board Discussion. What if anything does Sigma Xi do about it? Today, Donald Trump made the most foolish decision of any president in my lifetime, withdrawing the United States from the Paris climate agreement. I have sent the following message to my state and federal representatives. "Do whatever you can to reverse President Trump's decision to remove the United States from the Paris climate agreement." Trump risks committing all of our descendants to a world in which Earth's 100-million-year-old fossil fuel deposits will have run out in a few centuries, leaving adverse climate impacts that will last for hundreds of millennia. At a time when developing the means for extracting CO2 from the atmosphere should be a top priority, Trump has turned his back on the problem. I ask all Sigma Xi members to urge their governmental representatives to take steps to reverse President Trump's decision. You have been brainwashed. Withdrawing from an unenforced Accord which allows China and India to spew as much carbon into the air as they wish while we pay them (along with others) billions for some unidentified reason is a good thing. I challenge you to identify how it will reduce carbon in the air if China has no obligation to reduce the carbon they produce while they are allowed to continue to making the junk we decline to produce, (perhaps with more polluting factories, I can't say for sure but their record is not stellar.) and then ship it to us, adding even more carbon into the air from the shipping. India also has a free-pass and will receive some of those billions green money. You can't identify how it will help the climate one iota unless all countries are treated equally with enforcement. Leaving such a feel-good organization of hypocrites was a good thing. Did you overlook the President's statement that he is open to a fair agreement with the senate involved? Did you overlook the fact that the previous US entanglement was made illegally without senate involvement? Did you overlook the news account that the former president just bought an 8 million dollar house with no identified income? Do you think the US alone can solve the global problem and pay the bill? Can you identify one person who had a solution other than pointing the finger at someone else? My contribution is that with the obvious level of brainwashing going on in the world, among supposedly intelligent people, the first step should be to devise a workable plan, then sell it; not push an unworkable plan of unknown parentage for unidentified purposes. I recently took the time to read the Paris Climate Agreement. Fifteen pages, 29 Articles. The Preamble lists numerous U N issues all Parties recognize such as human rights, migrant rights, children's rights, gender equality, "climate justice", etc. Article 1 clarifies the Parties and Article 2 briefly states Goals as; 2 deg C temperature rise , eradicating poverty, and creating "finance flows" to lower ( CO2 ) emissions. The next 27 Articles define what amounts to a "Worldwide Climate Government". The purpose of this Climate Government is to enforce Article 2. I can see why so many countries like the Agreement. It is a first step to World Government, Climate Justice, and Finance Flow. I can also see why Obama kept it from debate in the U S Senate. This Agreement, that the US entered into as an Obama legacy, is Globalism squared. Several months ago I stated that "science is not political". Clearly my naiveté was showing. Climate Science and the Paris Agreement represent a world class combination of Science and Politics. This result didn't just happen spontaneously. It has taken years to build this momentum. Many scientists, as well as the general population, have jumped onto what is now a runaway freight train. Every branch of the Natural Sciences is being reported as impacted adversely by a 2 deg C global temperature rise. Economists from major universities are pitching in to predict finance flows and GDP for various RCP's. Some people say the end of the human race is possible. By opting to jump off this fright train the Trump Administration has taken on a huge political challenge. Lots of luck. For my part, I hope the train is slowed enough to keep the US sovereign. "If this is 'world climate government', it's a lot less powerful than my condo board, which can fine me for having the wrong color window shades." The comparison may have ignored differences in scale but it admirably avoided ad hominen arguments. A scientist should remain skeptical until all doubt has been removed. Anything else is not science. Science represents the triumph of rational thought over panic and mob response. I'm shocked and ashamed to see so many people who belong to the Sigma Xi scientific organization who cannot think rationally. I always thought that I belonged to this organization because members were rational, skeptical and believed in the scientific method. If doctors researching heart disease were willing to accept the same "scientific standards" used in studies of "man-made climate change" then most of modern medicine concerning stroke and heart attack prevention would never have occurred. Unfortunately the purveyors of "man made climate change" do not have to answer to the stiff standards of the FDA. I am actually delighted that the President has withdrawn the US from the flawed Paris Agreement which had nothing to do with "climate change" or with "science", and had everything to do with politics. The President has correctly pointed out that the Paris Agreement had more to do with income redistribution than it does with climate change. The President has shown that he understands science and that he understands how to tell the difference between science and politics. It is so refreshing to have a President who can think clearly; President Obama was such a failure; I say this while noticing that supporters of this last President are exactly to same people complaining about President Trump's action, which shows clearly how the Paris Agreement discussion was mostly political and not scientific. The foundation of science is the scientific method, but in my opinion those who religiously insist that man-made climate change is "proven" behave more like the adherents to a religious doctrine than scientists. The fact is that the case of man-made climate change is far from a proven hypothesis and predictions of climate change by advocates of man-made change have, over the past 60 years, been wrong the majority of the time because models of climate behavior have proven problematic. Predictions have been wrong again and again. Those who talk about "settled science" do not understand what science is, and they forget that at one time "settled science" was that the earth was flat and the sun revolved around the earth, and at another time in the 18th century when "settled science" was that it was impossible to provide enough food for the world population and there would be mass starvation in the near future. None of this was good science; a scientist is always skeptical of an hypothesis, never wedded to it. Aside from his remarks comparing President Trump favorably vis a vis ex-Prez Obama — an atypical view in the Sigma Xi Member to Member milieu — he spoke commonplace truths about the need for a scientist to think rationally. It would seem hard to argue with what is a commonly-held insistence that the scientific method, the foundation of science, precludes a scientist having a "religious" attachment to his hypothesis. Yet within two weeks, there were 115 responses and the mail wasn't tapering off. I dwell on the letters in this thread because they illustrate two prominent trends that are occurring in the scientific community. There were, on the one hand, dialogues and even small-group discussions detailing various aspects of global warming. These were informative. The writers were pooling observations, correcting imprecise data, and assessing the significance of different pieces of information. The object was to sharpen their understanding, to develop an accurate assessment of the severity of global warming and to determine the impact of plausible causal factors in what appears to be a much more complex process than has usually been asserted. There were, on the other hand, some grotesque tirades, savaging Pres. Trump and anyone who disagreed with the belief that there is a high degree of global warming and it is caused by human activities that are overloading the environment with greenhouse gases. "You can think what you like (self-deception is very common) but statistically the chances are quite good that some of your acquaintances are racists, just like the man they voted for. Biographers have documented the fact that Trump's father was a racist and that Trump emulated him. He really didn't make any secret of it, so anyone who voted for him voted for a man who openly admitted to racism, sexual assault, infidelity and walking in on his pageant contestants when they had no clothes on. Plus he lies constantly, as documented by the fact-checking organizations. What is amazing is that so many "Christians" could vote for an obviously morally bankrupt candidate, even though they are hypocrites of the worst kind." Trump was accused of destroying our national parks and monuments, an odd remark, considering that it is the Anti-fa and the Black Lives Matter movements that are currently destroying historic monuments. Come to think of it, being an Anti-fa is one of the few things Trump hasn't been accused of being. Some remarks showed chutzpah. One letter taxed Trump for having vacant high-level slots instead of a full staff, ignoring that confirmation of his choices has been blocked and delayed in Congress. Perhaps taking a cue from Hillary Clinton's basket of deplorables, one individual wrote, "I don't know what the non-thinking half of the country thinks about him, but the thinking half thinks he's an impulsive narcissistic bumbling idiot who is incapable of telling truth from fiction." Wow! Others accused him of endangering national security, weakening NATO and the European Union and subverting American democracy. Additional defects are that he is white and conservative. We are told that ACA "was working pretty well until Trump was elected," even though the number of insurers leaving the system has been steadily increasing ever since ObamaCare was instituted. The Galileo gambit: It only takes one concept (however bizarre) to destroy everything climate science has ever stated. The Auditor: Every new paper is scoured for tiny mistakes in wording or data that is not shared to demonstrate the paper's conclusions are false. The Political Scientist gambit: As soon as you say anything that smacks of an action or policy - you are labelled as a political science hack so have no further credibility as a scientist. If IPCC said it, therefore it must be wrong: Beginning with the political role of the ICC and ending where "peer review" really means "pal review." The Armchair Skeptic: Everything must be proven from first principles, no matter how trivial, or it is not allowed in the discussion. Uncertainty Gorilla: We cannot take action until we are 100% certain of everything that will happen. Just wait a few more decades then we can see if anything is going to happen. The Deflector: Every time a point is defeated, it is never rebutted or acknowledged, but a new topic is brought up - The Wack-a-Mole game. Hockey Stick graph: Every graph is traced back to Michael Mann's hockey stick graph and immediately discounted. The Conspiracy theorist: New World Order, Agenda 21, Communist plot, all designed to enslave everyone and take our money with green taxes. Celebrity Role Model: The riches of Al Gore, Leo DiCaprio etc. mean they are not honest about their support for anti-global warming initiatives. If you don't live in a cave and eat roots, or worse take an airplane to a science conference, you are the same hypocrite. The Magic Technology: Don't worry someone in a garage somewhere - just like Steve Jobs - will come up with the magic technology to save us all. The Puny Human argument: Humans are to [sic] insignificant to make any impact on the climate. A single volcano will wipe out anything humans ever did. I imagine there are lots more, but this is a start on figuring out the troll management of a climate science argument. WERE MOST OF THE WRITERS BELIEVERS OR DENIERS? Some were uncritically believers. One member loftily rejected the possibility of long-term cyclic changes from very hot to very cold. "Sigma Xi," he told a questioner, "has a very clear position on the climate change that Earth is currently experiencing, and it doesn't involve 'periodic climate cycles.'" So there. Case closed. The reported global temperatures are usually taken near populated centers where temperatures are higher than in the country or over the oceans. Also, measurements from isolated regions like Siberia are not included in the averages. However, temperatures inferred from satellite drag measurements are reliable global temperatures. The drag measurements reveal that the atmospheric temperatures have been going down for at least 10 years. [...] That means that we had an unusually low solar minimum, and therefore unusually low temperatures. This all fits together if we are willing to admit that the atmosphere is cooling down. Please take a look at the sunspot numbers for the past 20 years. There are two distinct regions of the atmosphere involved. The lower layers (e.g., stratosphere and lower, where almost all of the mass of the atmosphere resides) are the layers where the greenhouse effect is warming the atmosphere and where the increased amount of greenhouse gases, including carbon dioxide and methane, are causing the atmosphere to warm to levels that in the future will be problematic. What happens in these lower layers is that the incoming solar radiation, mostly in the visible region, reaches the Earth's surface, is absorbed, and warms it. The warmed surface of the Earth radiates heat, but this is mostly in the infrared region of the spectrum, and the greenhouse gases, which are transparent to the visible incoming radiation are highly opaque to the infrared radiation, which is therefore trapped and takes a long time to diffuse out (of order decades). As a result, an increase in the amount of greenhouse gases results in an increased amount of trapping of outgoing radiation and a warming of the atmosphere. The temperature of these layers decreases with altitude, since most of the mass and heat are trapped in the lower layers. However, the amount of volume increase involved is very small. We are still talking (over say the two decade period ...) about an increase in temperature of perhaps 0.2 Kelvins; that is approximately 1/500 of the temperature of the atmosphere, and because the gas law says that pressure times volume is proportional to absolute temperature, you are talking about a volume increase of approximately 1/500 of the volume, at most, perhaps 0.1 km of altitude (these are ballpark figures but I think about right, and are probably an upper limit). The outer layers (thermosphere and exosphere) are heated by an entirely different mechanism, unrelated to greenhouse gas warming. It is these layers that [the physicist's] message is referring to when she talks about the effect on satellites. These are the layers where the near-Earth satellites orbit the Earth, including my favorite one, the Hubble Space Telescope, which I worked on for over 20 years. The mechanism that heats these layers is unrelated to the greenhouse effect that warms the lower layers. These layers are directly heated by high-energy solar radiation. The amount of mass involved is tiny. Because a different mechanism is involved, namely direct heating of the very thin atmosphere by high-energy solar radiation, instead of the temperature decreasing with altitude as it does in the lower layers, it actually increases with altitude, to a temperature of several thousands of Kelvins. This doesn't harm the satellites at these altitudes because the amount of atmospheric mass is very, very tiny, but it also means that a very small increase in solar radiation can result in a large increase in the altitude to which these outer layers reach and hence the drag on the satellites. Conversely, a very small decrease in that radiation can result in a large decrease in the altitude of these layers. What [the physicist] reports has happened in the past 20 years is consistent both with an increase in global warming and with a decrease in incoming solar radiation. The increase in global warming has resulted from an increase in greenhouse gases and a consequent trapping of more energy in the lower atmosphere. It has been accompanied, likely, by a very tiny increase in the altitude of the lower atmospheric layers, including the stratosphere. However, at the same time there has been a period of low sunspot count, at least ten years long, which is typically associated with a lower amount of incoming solar radiation. This lower amount of incoming radiation would be associated in turn with a lower amount of heating of the Earth's surface, however, it would take decades for this to be seen in the surface temperature records (because the greenhouse trapping of heat is a decades-long process). BUT, it would quickly be evident in the amount of heating, and therefore the altitude, of the layers of the upper atmosphere (thermosphere and exosphere), where the satellite data is relevant. And, since the expansion/contraction of the lower atmosphere is tiny compared to the expansion/contraction of the upper atmosphere, due to the different conditions, it is quite consistent with physics for there to have been an increase in global surface temperature (which is measured with great confidence) at the same time that there has been a contraction of the outer layers of the atmosphere which are responsible for atmospheric drag on satellites like my cherished Hubble Telescope. CO2 is probably the easiest component of the system to model because it is a well mixed gas, has a long residency time, is essentially inert with respect to the gases around it, and has static absorption profile. However, when its contribution to global warming is modeled, it is very modest. Those who claim CO2 has a large effect on climate must incorporate feedback mechanisms that increase the water vapor contribution to the climate model resulting from small warming caused by CO2. This is not in dispute. Personally, I do not see evidence of this feedback occurring in the natural system (although it clearly happens in the climate models). The baseline increase in temperature that I observe, at least over the last 100 years or so is the equivalent of that which would be caused by the observed increase in CO2 as a standalone gas. With each new iteration of climate modeling, the models edge closer and closer to this lower trend because, in the end, these models must postdict [the opposite of predict] the temperatures of the modern era. Considering how much damage our breathing out CO2 is said to do to the environment, it was a relief to discover — as another member phrased it — that "...climate scientists agree that CO2 as a standalone cannot come close to varying the temperature to the magnitude needed to produce the observed temperatures." He too spoke of the importance of water vapor. He added, "The albedo effect of clouds is also one of the major negative forcings, so determining this ratio is crucial, yet it represents an insoluble problem with the level of computational granularity currently available in climate modeling... cloud formation is the least understood component of the model, so it could swing results considerably." His letter, to me, was a homily on the theme: the more important a feature might be, the less we seem to know about it. Other factors were named as determinants of change. Solar irradiance as the trigger was considered, but others pointed out that this is not universally accepted. A writer noted that "there are numerous other mechanisms that are not included in modeling, including continental and oceanic distributions and currents, volcanic activity and intensity, global vegetation distributions, and many more." This suggests we are at a stage of knowledge where we can't determine which ones of the many candidates might account for climate change. This doesn't seem to worry the opinion makers that are sure and certain they have a handle on the essentials. "The IPCC coupled climate model behavior does not match the satellite observed behavior nearly as closely, so some work is needed there to determine why. Essentially the IPCC models show no lag between surface temperature anomalies and radiation flux and the satellite observations consistently show 3-6 months lag times." "Does not global warming constitute an increase of energy in the dynamic weather systems, so that there is not only an change in average values, but also an increase in the magnitude of fluctuations? What would drown the gerbil would not be the several cm rise in your plots, but the big surf that swamps his surfboard. Is that not the mechanism that seems to have led to more coastal flooding, beach erosion, and storm associated damage." I took it as a gentle way of reminding people that more precision in the hairy problem of connecting data and actual consequences would be useful, if, as Science Society CEOs claim, they want people to base decisions on evidence. I fall in the "it hasn't been proven" category. And if there is never solid evidence based on a consideration of all the critical parameters, I won't be surprised. My rejection of the flat assertion that we're dealing with an irreversible heating up of the atmosphere because we breathe out and use fossil fuels dates back to 2009 when the hacked emails from the East Anglia University climate researchers were posted on the internet. I didn't see how we could accept their far-ranging conclusions when in many cases the open spaces surrounding the sensors collecting the data were built up over time, thus contaminating the readings. One email detailed how the programmer handled sensor data when the numbers overflowed machine capacity. Multiplying two negative numbers yielded a negative number, an impossibility. So he discarded sensor data until the results were positive. One line of reasoning impressed me considerably. Here are snippets from the letter. One data set of global climate history that appears accepted as authoritative is the Vostok Ice Core data (1999). A chart of the Petit (Jean Robert Petit, LGGE-CNRS ) Ice Core Temperature data is attached (Vostok1). From these data, there are witnessed five major global rapid warming events over the period of approximately 500,000 years BP. Four of these warming events were followed immediately by rapid temperature drop, and apparently into near-global ice events. It is also notable that at nominally 32,000 and 13,000 years BP, the peak temperature reached roughly 3 degrees above that present. This is arguably higher than the present global warming postulated. From these data, it is seen that the latest warming event started approximately 17,000 years BP, and peaking at nominally 11,000 years BP. This is long before any global industrialization, and can be reasonably argued to be another of the natural warming events as those witnessed previous in the Vostok data. The remarkable feature of these data of the present epoch is the absence of the previous cooling events, but rather with the temperature remaining within several degrees of that present. Also, there is witnessed a nominal two-degree temperature spike at about 8,000 years BP, and three nominal one-degree spikes at 4,500, 2,300 and 400 years BP respectively. These too are arguably prior to any significant human industrial activity. Note that I make no reference to any anecdotal evidence, such as receding glaciers, sea-level rise and other subjective observations, or to change in CO2 or CH4 concentrations, or other factors often cited as the cause of global warming. I do not argue that such empirical evidence is or is not relevant. But rather I simply cite and examine only actual historic global temperature evidence. Citing anecdotal evidence, such as receding glaciers, sea-level rise and other subjective, empirical observations, as evidence of global warming, and increased CO2 and CH4 concentrations as root causes, but with no sound supporting scientific basis, is simply a Post-Hoc fallacy. And indeed it may be found that the factors such as increased CO2 and CH4 concentrations cited are indeed the result, and not the cause, of climate change. It would seem that the actual scientific records of global climate refute the arguments of present catastrophic rapid global warming. Such observations of receding glaciers, sea-level rise and other subjective observations, although apparently true, are moot. It would seem that rather than arguing such anecdotal evidence, it would be of greater value to try to understand the global science and discover why the global temperature has been nominally stable for the past 11,000 years, and has not returned to an ice age 10,000 years ago as witnessed following the previous warming events in the historic record. Perhaps with that understanding, we can understand the nature of the subjective observations, and to determine how, or if, we can actually effect climate change. As an aside, he pointed out that the 'hockey-stick' temperature graph wasn't evidence because "there were no remarkable human industrial-scale activities in that period." He later accepted that the drop in CO2 coming after a drop in temperature might be the start of a new cycle, not the end of an old one. I am happy that we can get back to an evidence-based discussion without aspersions on our status as scientists or insults in regard to our individual intellect. The challenges posed by climate change are too serious to get bogged down in politics. I think that the empirical evidence must speak for itself, and that evidence and every thing that I have personally observed argues eloquently for a relatively rapid alteration in earth's climate brought about by human activity. No amount of wishful thinking can change that unless unequivocal data exists that refute this conclusion. So far such counter-data seems to be missing. So the question now is how to we proceed so that the data so far collected can help us mitigate the effects of climate change. My take on the points made by the various scientists is that a genuine consensus has not yet been reached. So it is foolhardy to invest a large part of our capitol and change our political system based on our limited understanding of climate phenomena. It's true that the weather, it is a-changing. Humans are being blamed, but we don't really know what's going on. It's a good idea to clean up the environment — getting rid of smog and drought and having clean lakes are doable without us being spendthrifts. But to turn over the control of our lives and what we do and how we should think to some centralized global organization! It would certainly change our lives. But it is unlikely to have much impact on changing climate. Maybe what we need is less propaganda and more attention to observations that don't fit the received wisdom but which might be the start of deepening our knowledge of what's going on in our environment. That isn't what's happening. There does seem to be a walk-back from the assertion that death by heat is almost upon us. But when all is said and done, the inevitability of doom if we don't change our style of life continues to be promulgated. As an example, this is what Rush Holt of the AAAS wrote while many of the membership in loose coordination were trying to better understand climate change so that we might actually know what to expect and how best to deal with it. It happened: President Trump decided to pull the United States out of the Paris climate accord. This latest in a streak of misguided and short-sighted actions by the current administration is worrisome. And what troubles me is not that there are policy differences, but rather that this decision was made with apparent disregard for scientific evidence. The EPA has already sustained harsh staff cuts, and the threat from the administration of devastating funding cuts looms over NOAA, NIH and the Department of Energy. And still, there appears to be little or no scientific advice supporting the administration's decision-making. It's up to us, as science advocates, to do everything we can to fight crippling cuts to these organizations, to support research that can save our communities and our planet, and to see that scientific understanding is sought and provided. AAAS is leading the way, but we need your help to continue to protect the advancement of science and give policymakers the tools they need to make evidence-based decisions. Advocacy in the Future: The Scientist as Shill? Once the scientist was somewhat hampered in his behavior by stereotypes and expectations. Now he is encouraged by his own leadership to participate in non-scientific events in the community. Raucous activism would once have been shocking. No longer. The waves of marches, rallies, demonstrations and riots have left their mark. Moreover, whatever cause a scientist might take up or dislike, he will easily find organizations he can join that openly demonstrate for or against it, whatever their root agenda. While Climate Change is the lead concern of the members of many scientific societies, other concerns have also been stirring up the troops. There is shock and dismay that the EPA is being reined in. What is ignored is that the EPA was ex-Prez Obama's vehicle for bypassing Congress to carry out questionable 'environmental' causes. He saved the air from pollution by stopping the burning of coal and oil in favor of solar and wind energy, power sources that are promising but that aren't anywhere near capable of handling our actual energy needs. These defenders also forget that Obama's dream solution was to increase the price of automobile gas and diesel fuel, so they'd be used less, instead of focusing on how to supply the energy we actually need. EPA also saved 'nature' by storm-trooper tactics of taking over land in Western states. When the EPA functions properly, it does an admirable job cleaning up lakes and rivers. But issuing arbitrary and unregulated regulations that aren't authorized by our elected representatives is cause for concern. The temporary ban on immigrants from the Middle East is another talking point of science society administrators. 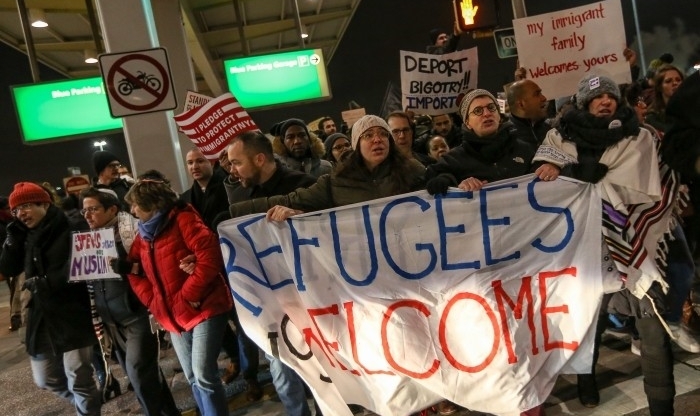 Polls indicate the majority of Americans worry about the importation of 'refugees' from the Middle East — they tend to be unvetted and unequipped to handle a job. They come from countries such as Somalia and the Sudan that are known for training terrorists. Supporters of course only refer to them as immigrants, which cleverly reminds us that for many decades most of our ancestors came to the USA as immigrants. They ignore that these new immigrants are different than the old: they are almost all Muslim, from countries that encourage conformity with the Koran. If their behavior in Europe is indicative, we can expect them to refuse to assimilate and they will become a welfare burden. They are already pushing for Sharia courts and claim erroneously that sharia law and Constitutional law are not antithetic. I don't know how many immigrants are in science and in what capacity but scientists have twittered a specific concern: they are worried that the ban on immigration will affect the entry of foreign scientific personnel. Ignoring both the temporary nature of the ban and the fact that scientists are unlikely to come from the Middle East countries targeted by the immigration restrictions, C&EN, the newsletter of the American Chemical and Engineering Society, for example, asserted that "Chemists' lives [are] upended by ban" and queried the membership, "Worried about how these shifts will affect you, your company, or your university? C&EN wants to hear from you for an upcoming article. E-mail us at cenprojects@acs.org." (The Chemical and Engineering News, January 30, 2017, here.) This reaction was not a small blip. Some 150 science organizations wrote to Pres. Trump concerned that an immigration ban would "compromise the United States' ability to attract international scientific talent..."
if the role of Sigma Xi is to be effective and stay within the science arena, the most important aspect in the next 4 to 8 years or more will be to reach out much more to the general public and help to create a support system that engages young people and those who are uncertain about why science is important even though in some cases it seems to make things cost more because of restrictive policy consequences. A young 19-21 year old in 4 to 8 years will become a fully functional member of society who will be able to significantly influence decisions. The scientist is being encouraged to take on new tasks. He is urged to enter places no scientist has gone before. I fear we may be entering a new era where integrity and individualism are discounted in favor of bringing the true faith to the public. Sponsored scientists are starting to give professionally-organized talks on how climate change relates to environmental health and human health. No one seemed to think it funny that a scientist meticulous in his own limited domain would consider talking learnedly about three such large subjects in one lecture. I spent a pleasant few minutes imagining such a talk, loaded with super simplistic statements such as "As things get heated up, the whatchama-call-that nerve that goes to the heart, it's going to be highly stressed. And that will affect your heart. And you know how important that is. So don't let anyone tell you Climate Change isn't dangerous." In a most polite, politically acceptable way, Katie Burke lists some of the most commonly used ways to sell a product. Specifically, how can a scientist learn to persuade in ways that have been scientifically-determined to work? Stripped down, these tactics teach how to engage the audience, including emphasizing what you and the audience have in common. Be local in scale and approach. Talk about how AGW hurts them and their families. Let the audience know that the social groups important to them, the people they admire and trust, accept there's a problem with the climate changing. In fact, everyone know there's a problem, except maybe a small number of foolish and ignorant deniers. Who wants to associate with them anyway? Remember, the less intelligent the audience, the more (simple) pictures and slogans the better. And, for pity sakes, like any good politician, try out your speech on your own focus group before you go before a bunch of civilians. Many scientists would agree with the Sigma Xi member who wrote about "the modern political climate as representing a triumph of propaganda, and an abject defeat for everything from clear thought to simple virtue." But many others appear to welcome the new opportunities for creative activism. This letter encapsulates this enthusiasm. It asserts we must inform and educate. It doesn't ask whether we really have enough solid information ourselves to educate others. Your letter warmed my heart. We must resist stupidity, that is not political but simply responding to poor policy. We should feel obligated to take a stand when our future is in jeopardy. I have my March for Science tee shirt which I wear proudly. I have found that many of my non scientist friends and acquaintances respond positively to the message. Let us not be fearful that we are being "political" when we, in fact, are simply resisting the forces of ignorance. We must inform and educate. IS OVERWHELMING MASS ENTHUSIASM BY SCIENTISTS POSSIBLE? Historically, we have seen occasions where scholars and scientists have been totally caught up in carrying out a political imperative, to the point where they disregarded their society's most cherished values. At the same time, having governments regulating our lives is less and less seen as intolerable by scientist and non-scientist alike. If we don't like the lunch the Administration has decided we should eat, we don't force the bureaucrats to stop bossing us around; at most, we throw away the lunch. A Sigma Xi scientist pointed out that "the Paris Accords are largely societal decisions. They are largely based on political opinions, and are not in any way credible scientific facts, or legitimate scientific conclusions." Yet many people, scientist and non-scientist, take AGW seriously enough to consider giving power to a centralized planetary government. Popular more than three-quarters of a century ago when the United Nations was brand new, a one-world government, likely to be administrated by politicians of the type now serving in the UN and the EU, is again being vaunted as a good thing. There are two trends in our society that encourage the scientist to submerge himself in some all-important social undertaking, inside and outside the laboratory, particularly one that is coated with the veneer of science. Prestigious leaders of science and influential academics and politicians stress how important it is to make the public and the politicians understand what we need to do to that save ourselves and the physical environment. So justification for neglecting the nuts and bolts of science to act as evangelist is unnecessary. Then too, if everybody knows global warming is caused by human activities, is there really a need to spend a lot of time doing difficult and isolated work in the laboratory to refine the data still more? Perceptually, the image of the dispassionate scientist has been shattered. And the new ways to participate that are opening up are easy and enjoyable. The new scientist can engage in political causes, where he can help people immediately and directly. He can join a group of friendly activists and enjoy instant buddyship. He can be part of the gang, and at the same time, enjoy the respect given to someone who is a scientist. Marching and lecturing and signing petitions aren't just fun. They are a way of fighting evil people who want to harm our environment. But there are always so many influences and events shaping and changing our ideas, who knows if enough people will decide en masse to give up their freedom for the greater good? I HAVE TRIED TO GIVE AN ACCURATE PICTURE of how high into the intellectual strata the raging hate of Donald Trump reaches and how nuanced is the actual story of AGW. Truth has suffered. Our sinful behavior and the glowing promises of redemption by self-abnegation are so exaggerated that rational assessments are hard to come by. The pressure to conform to what the global leadership recommends is strong. Projections into the future are of course unreliable. But if mass participation in promulgating the evils of AGW does catch on in the scientific community, the next stage in the radicalization of the scientist can be predicted fairly accurately. He is likely to spend a larger part of his time converting the masses. To put it bluntly, the scientist will act as shill for the global warmers. He will be the one to reassure the public that it is true and certain that we need super measures to save the earth and ourselves. The new scientist will exude confidence, not doubt. His message will be simple and strong. It will not be cluttered by hesitations or reservations or complications. Contrary to his own training, the scientist will be advised to never reveal that there is still much that needs to be discovered. Sadly, the scientist will be too busy convincing the masses to have the time himself to uncover the still mysterious features of climate change.